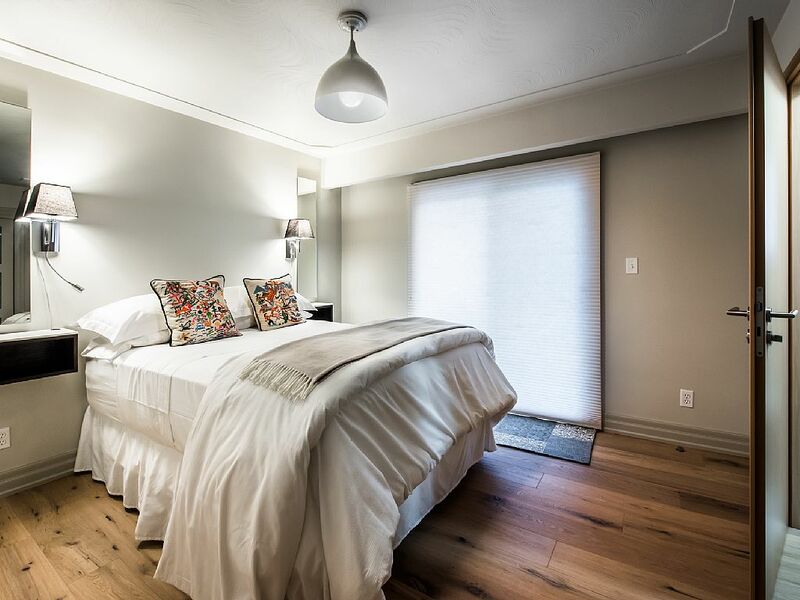 On Seven Residence | Toronto Short Term Rental Property Management Corp.
On Seven Residence, nestled in the heart of the Niagara Wine Route is a five minute drive to Old Town. 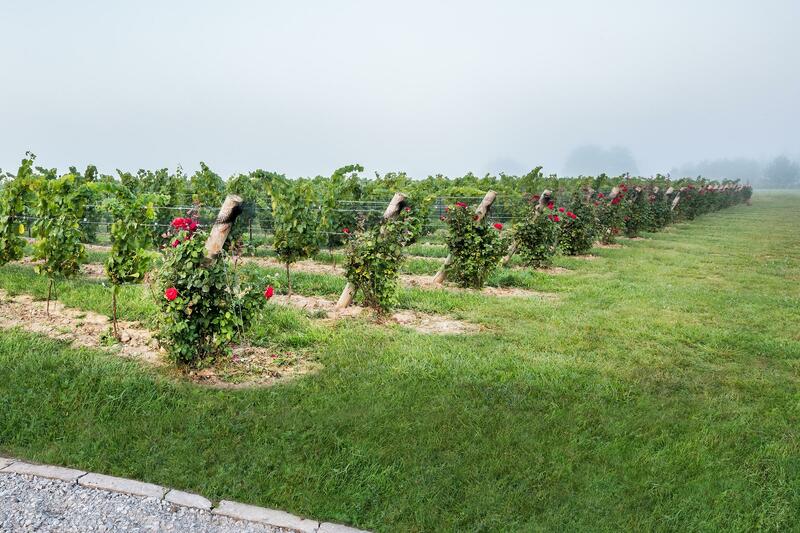 A perfect setting to visit wineries, bicycle along the Niagara River, attend the theater, sight see, or simply enjoy the beauty of the residence’s grounds and panoramic views of vineyards, Brock's Monument and the Lewiston Bridge. 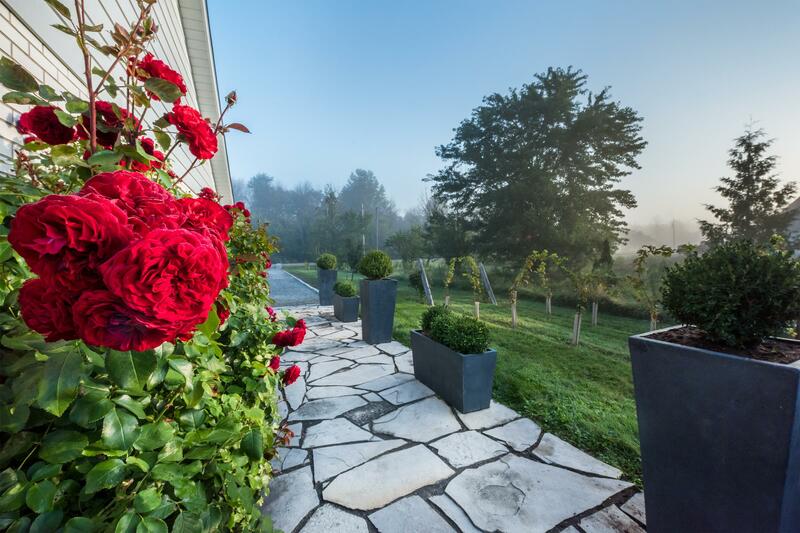 On Seven Residence offers you privacy and tranquility through fifteen acres of organic vines, fruit trees, flowers and vegetables gardens all cared through sustainable farming practices. 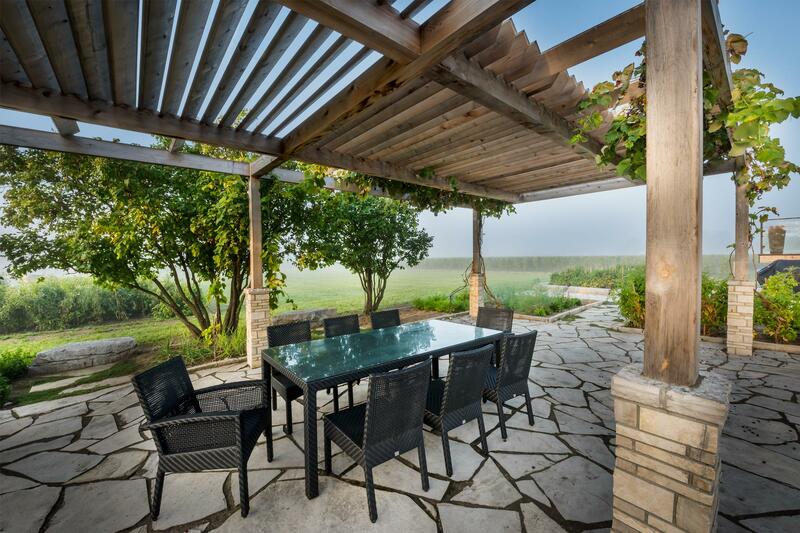 The flagstone patio has been designed to enhance the natural outdoor experience. 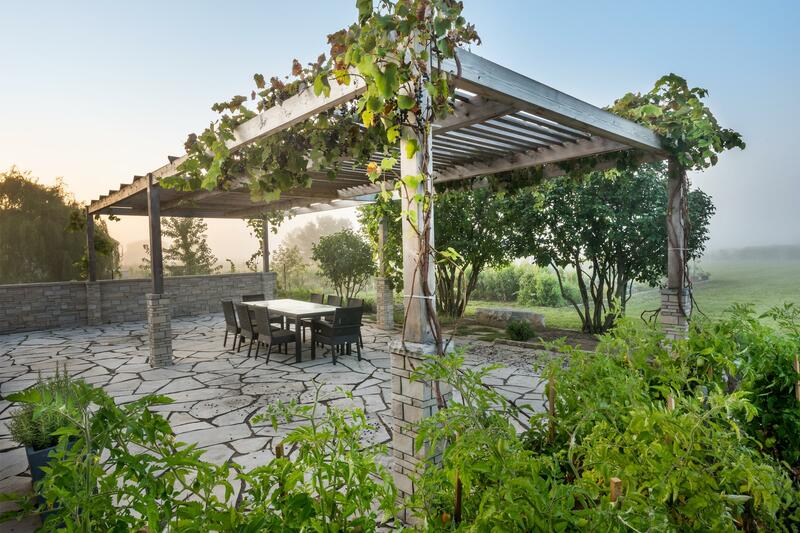 Enjoy your morning with specialty coffee or tea on the cedar deck while overlooking wine country, dine alfresco under the bright stars viewed through the pergola, or showcase your culinary skills on the harvest table overlooking the vineyards. 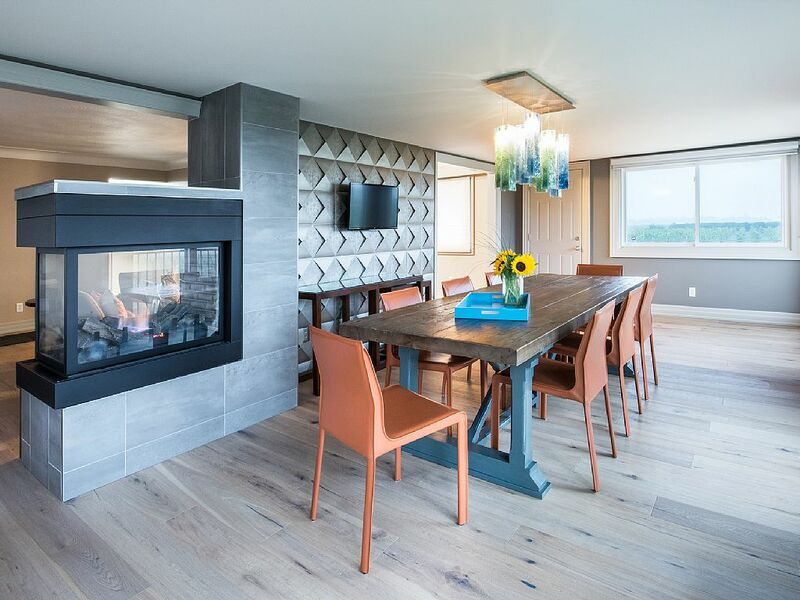 On Seven Residence has been elegantly designed with a gourmet chef’s kitchen, hand-scraped hardwood floors and Italian leather chairs. On Seven Residence provides a selection of premium television channels and wireless Internet. A three-sided fireplace and air conditioner will always fulfill your comfort needs. In the evening, retire in one of three bedrooms each fitted with pillow top comfort queen sized beds and luxurious linens. 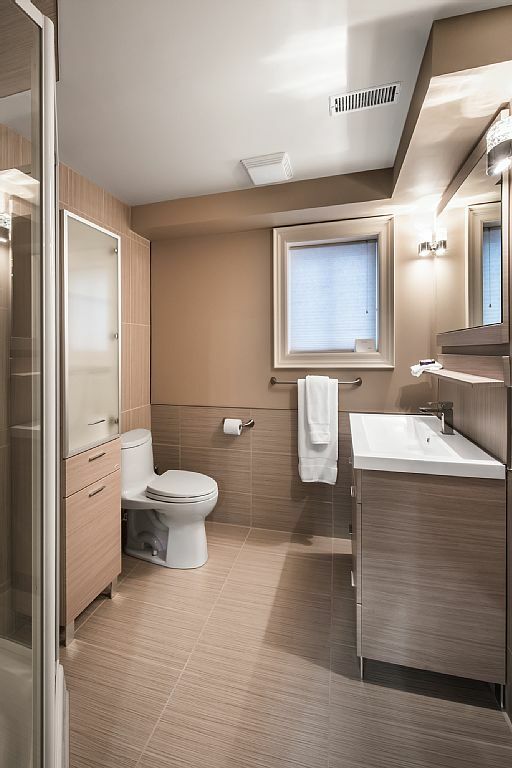 The three bathrooms include designer towels and natural soaps. 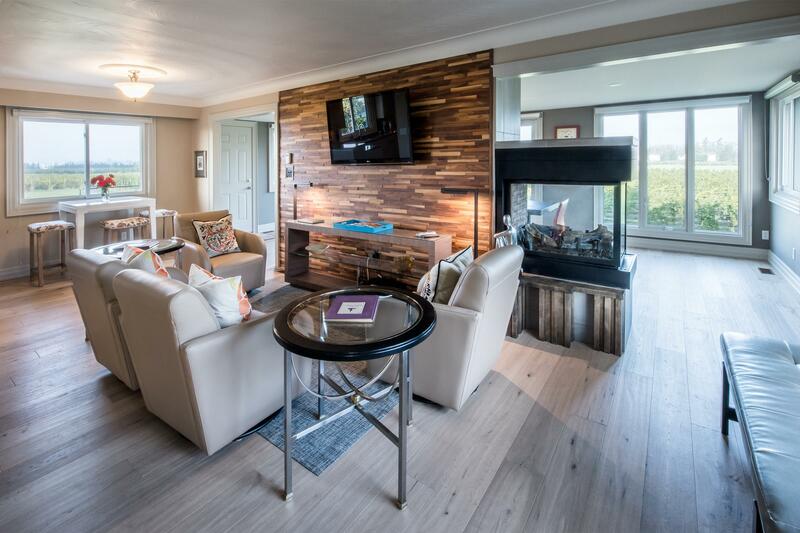 On Seven Residence offers a truly unique and memorable Niagara-on-the-Lake experience in a smoke-free and pet-free environment. Had an amazing time here. Completely exceeded our expectations! Would love to stay here again! Beautiful place. The house was so clean & the kitchen was very functional that we made breakfast there every day. We loved the touch of the fresh flowers cut from the rose garden & the roll on essential oils by the bedside. The design was very modern & exactly how it was pictured. 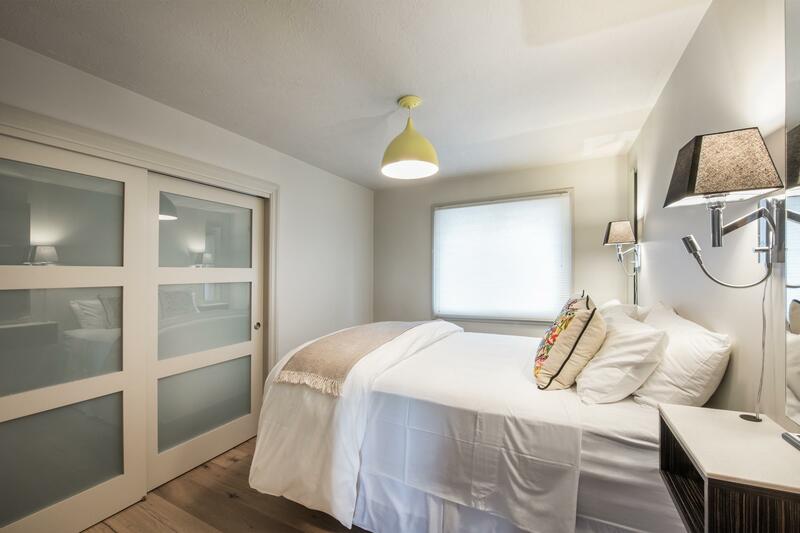 The 3 bedrooms are located upstairs, adjacent to each other. There is one 1/2 bath in the master bedroom & 1 main full bathroom upstairs. The 2nd full bathroom is downstairs. The property was spectacular & the ability to enjoy dining al fresco was such an added bonus. The location was very private & peaceful. It was the perfect midpoint to Niagra Falls & the quaint town of Niagra on the Lake. We would definitely return for a stay in the future. Review #23507011 Amazing house and property! We had a fantastic stay, the location was great, the grounds were beautiful and the interior of the house is clean and modern. Would definitely stay here again! 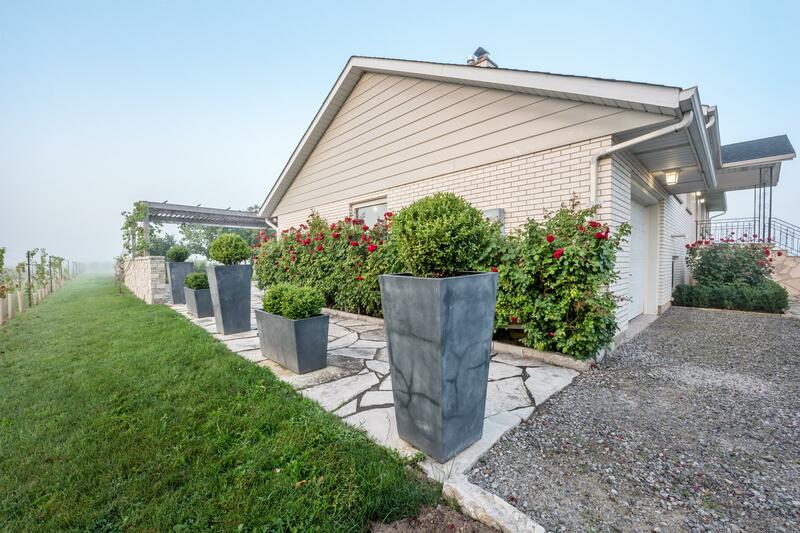 Wonderfully decorated and spotlessly clean home within an easy drive (or bike ride) to Niagara-on-the-Falls. Beautiful sitting areas outside and stylish sitting indoors. Mark was very responsive and easy to communicate with. There was someone to greet us upon arrival and provided a great rundown on the local sites and sounds. Highly recommend! What a wonderful place and location for our cycling trip in the Niagara region. Close to Niagara on the Lake, the Welland Canal, Niagara Falls, great wineries. All that 3 couples could ask for a wonderful cycling vacation. Lots of space to spread around if required. Our stay was great. The property was clean and we'll stocked, and the hosts were helpful and responsive. Great view and back patio! Great attention to detail. 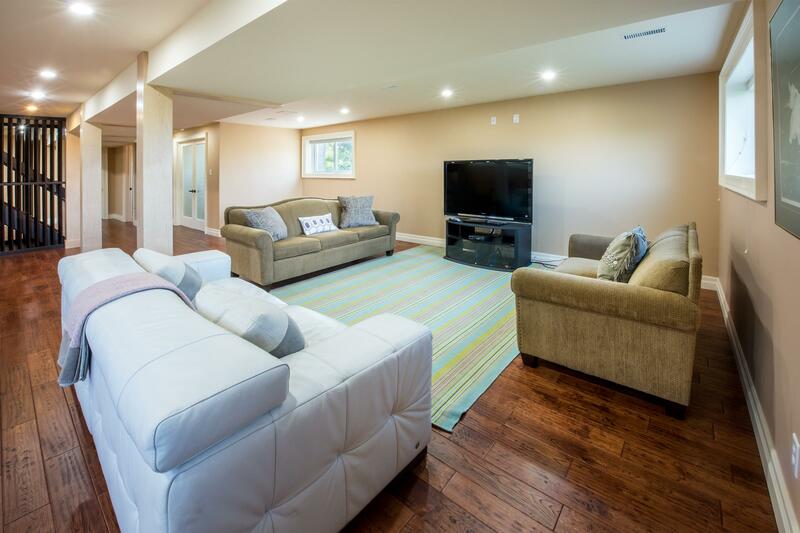 House kept in great condition with excellent fit and finish, design touches and outdoor space. A great spot that I would not hesitate to use again. Good location for Niagria on the lake and also Twenty Valley. Very easy to eat out around town or stay in at home with nice dining areas inside & out. Very clean and well decorated, would stay there again! The house is beautiful. I loved that it was outside of town. Quite, peaceful with the most amazing views. Kids loved the big back yard. We loved the patio and the BBQ. The house is 5 minutes drive from Niagra-on-the-lake and about 20 minutes from the falls. Everything in the house was comfortable and well laid out. Absolutely worth a visit! Even more beautiful in person. Very clean, modern, and well maintained property. 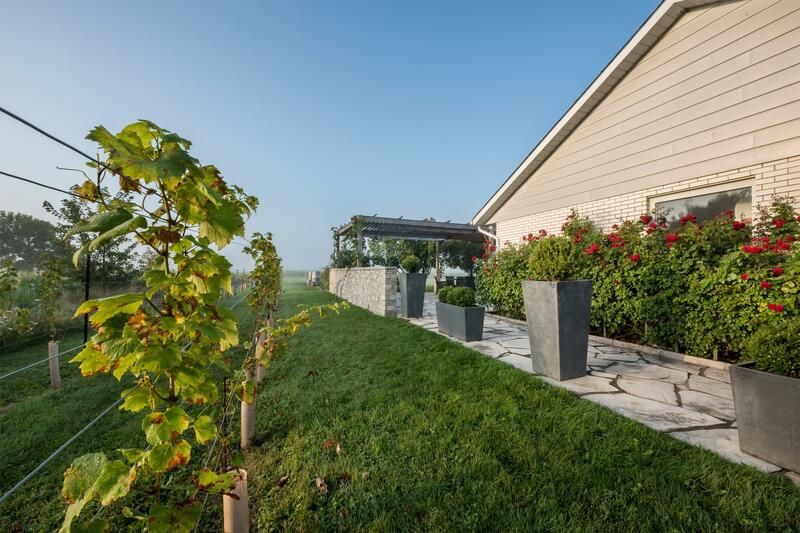 It is a ten minute drive to NOTL town, with lots of wineries nearby. There were 6 of us and we fit very comfortably, with most necessities provided. The backyard was gorgeous, very quiet and relaxing. The host was responsive and easy to book with. Would definitely be back! Beautiful, spacious home. Very clean and the property is absolutely gorgeous. Mark and team were fantastic hosts. Thanks so much for having us! Review #19718268 Perfect in more ways than one! From the moment we walked through the door we knew the weekend was going to be perfect. 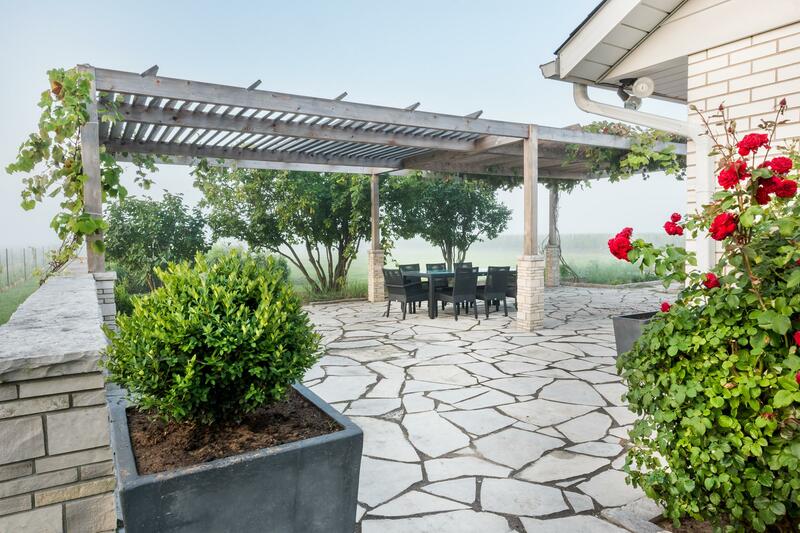 The house itself was well equipped, beautifully decorated with a modern flair, and the outdoor space, patio, gardens and vineyards were something out of a magazine. We enjoyed sitting outside having coffee with breathtaking views, or walking around the vineyard having a glass of wine. The location was a great distance, close to town and easy to get to and from many wineries. We will definitely ba back! If I did have one negative it would be the lack of dresses in the bedrooms. Sometimes it's nice to unpack but there really was no place to put our clothes aside from hanging them in the closet. The beds, however, were so comfortable! Thanks to Mark for everything! Great stay. The whole unit just worked for my family (6 adults). Mark is a great host. Very approachable and quick to reply to all messages. The home was absolutely beautiful with a spectacular view of the vineyards. Would definitely recommend and stay again. Mark was a wonderful host. The venues is exactly as it is in the pictures. Beautiful scenery. It was a great spot for our family to all stay together for a wedding at one of the wineries nearby and everyone was very comfortable. 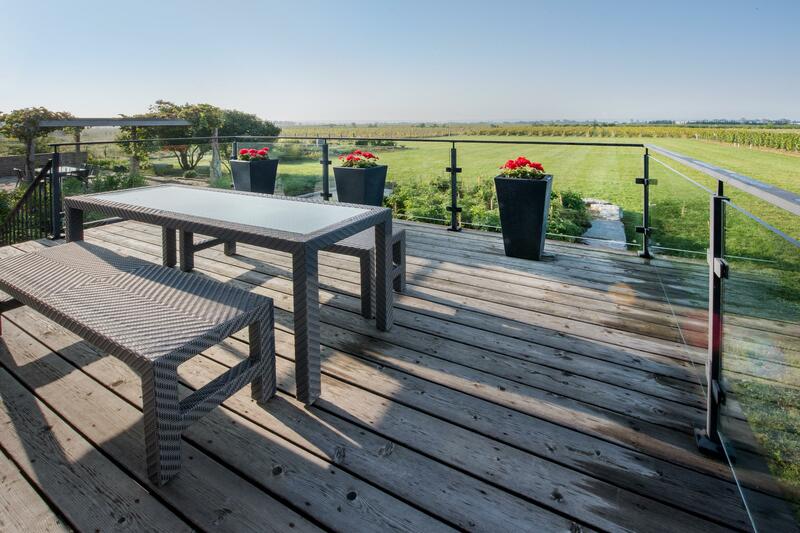 If you are looking for a lovely spot with a lot of room and great outdoor space in the country then this place is it. We had a great time, this is a great place to stay and visit the region. We are planning our return visit. Six ladies celebrated a 49th and 51st birthday recently. 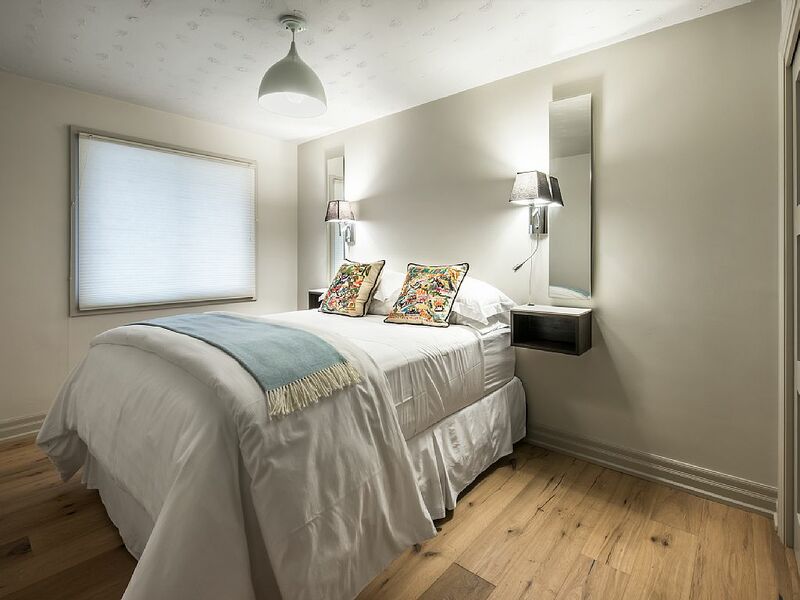 We were delighted with the accommodations; everything is high end - from the European kitchen and appliances with high end coffee and teas waiting for us, to the beautiful bedding and fixtures. The gardener surprised us with freshly picked strawberries and a bouquet of roses cut from the garden. (Yes, really!) This is a great spot to bike to local wineries (13 km one day and 23 kms the next). It's a 5 minute ride to the Niagara trail that runs along the Niagara River. We cooked and dined at the house one night and used Uber to take us to Two Sisters for dinner the next night. Lots of great spots to eat at inside the home and out and while we planned to do yoga in the vineyards we opted to sit and enjoy the sounds of sheep and horses beckoning from a neighbouring yard instead. You will really feel like you are in Tuscany if you stay here. Very peaceful, quiet and tranquil. We will definitely go back! Gorgeous and well located close to wineries. The owner greeted us upon arrival and answered our questions as it was our first visit to the area. Mark was most helpful. The house is well equipped and Newly renovated and fresh. The garden is gorgeous with a beautiful view of the vineyard. We enjoyed most of our meals outdoors on the spacious patio. Highly recommended and will definitely visit again. The place was very clean and spacious! It backs on a huge green oasis (vineyard)! Best part was waking up in the morning - super quiet with just the birds chirping!!! The living space was quite comfortable, but it was difficult to get cozy in the family room as there is no couch (as expected via photos). We had a great stay. Highly recommend! Hi Galina thanks for your feedback and kind words. As it relates to your feedback regarding the couch and photo: we take great effort and pride to ensure our marketing is accurate, and that our guests’ experiences are exceeded. We are not aware of any picture to which you reference, and would ask that you forward it to us so we can look into the matter. Another great stay at On Seven. The quality and cleanliness has remained top notch. We hope to return again. We had a great time. Great for family. What a wonderful stay! There were 5 of us girlfriends on a weekend getaway who stayed at the property and it was perfect. The house is gorgeous with an amazing backyard and great views. Mark was a great host and welcomed us with all the information we needed. We ate lunch, dinner and breakfast at the house and had everything we needed in the well stocked kitchen. I would definitely stay at this property again and would recommend it to others as a great alternative to a hotel in wine country when travelling with a larger group. Mark was very accommodating of our late check-in and his place was absolutely beautiful! We had a lovely stay and would definitely return. On Seven Resisdence is exactly as described and more. 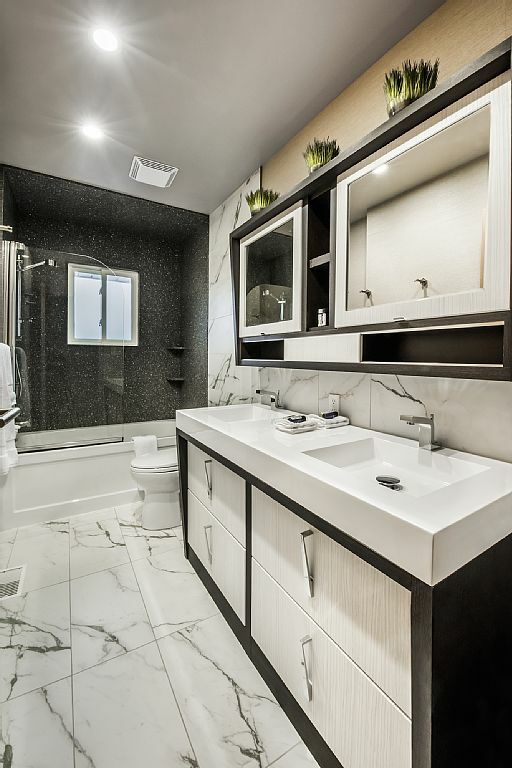 Modern, exceptionally clean and with high end finishes everywhere you look. Outside the views are something that have to be experienced as they far exceed our expectations. Mark was a pleasure to deal with as he was extremely thorough and his communication was second to none. We were a group of 3 couples but would recommend this property to anyone looking for an enjoyable getaway to this beautiful property and region. Great second stay at the property. Clean and meticulously appointed. Would definitely return again. Perfect place! Clean, modern, spacious and Mark accommodated our arrival time. Beautiful place!! Long weekend away with 3 couples. Plenty of room, great location, wonderful outdoor space. It was all we could ask for. Great location. We did Shaw festival, biking and wineries. The outdoor space was the highlight of the place. Would highly recommend for time at Niagara on the Lake. A beautiful home, exceptionally decorated and very comfortable. Very Close to Niagara On the Lake yet in a quite setting. The picture of the home does not do justice to the view from the back. 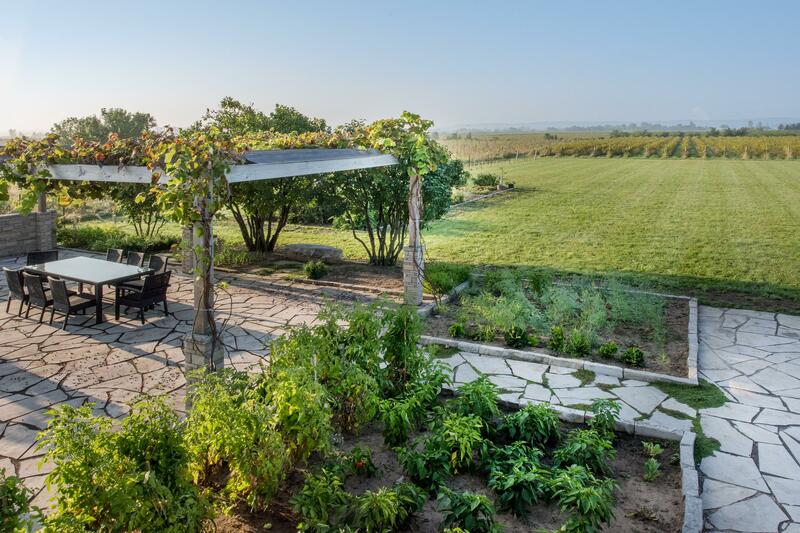 The garden and vineyard and outdoor space is fantastic. The entire experience was beyond our expectation. The house, the decor, the appliances, and oh, the view...each and everything had a wow factor in it. Highly recommended for family and a short getaway from Toronto. It is so much better than booking a hotel room in Niagara Falls region! We went with 3 couples for a weekend at the wineries. Absolutely gorgeous home equipped with anything you would need. The patio and backyard are stunning and offer great privacy. The location could not be better - a bike ride away to old town and many wineries. Would love to see a fire pit added to the yard! We had a wonderful stay. The house was clean and well cared for. The surrounding vineyard and garden was very peaceful and the large windows and patio allowed us to enjoy them to the fullest. Would recommend the property to anyone. Beautiful setting and the home was as described! Close to many vineyards and perfect for a mini-family reunion and getaway! Mark's place was gorgeous and was even nicer to experience it in person than in the photos. It's close to many vineyards, restaurants and bike rentals. It's equipped with many things to make your stay comfortable - stocked kitchen, clean white Ralph Lauren towels, patio lounging & dining sets, nice beds and bathroom. Great for a group trip! Mark was also a responsive host. Typically answering any messages within a few hours. He greeted us on our first day and was there to say bye when we left. The house is just perfect for a weekend getaway. Beautifully furnished, with impeccable views. The kitchen was also equipped with top of the line appliances and cookware. Mark is a great host, and really tries to make your stay as comfortable as possible. Thank you for a memorable weekend! We had an amazing stay at On Seven Residence! Mark met us at the house on check in and took us through the house and explained everything to us. The house was beautiful and very clean on arrival. 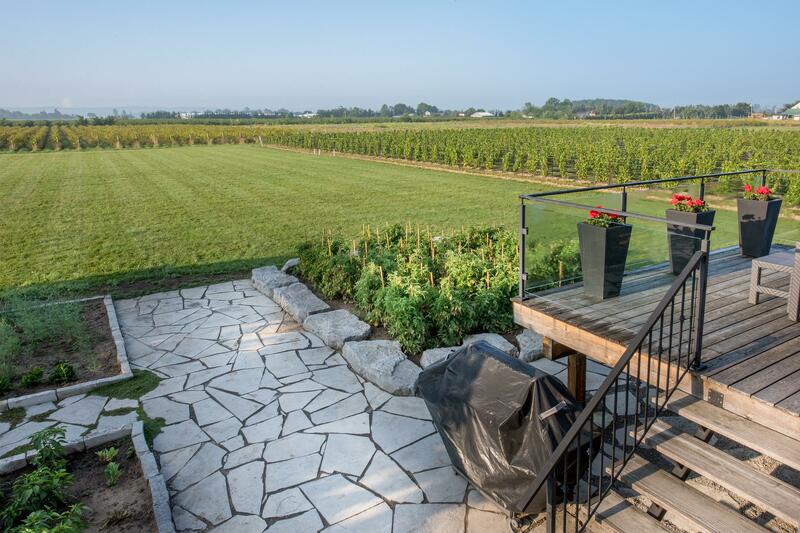 The back patio has a beautiful view of the vineyards and escarpment. 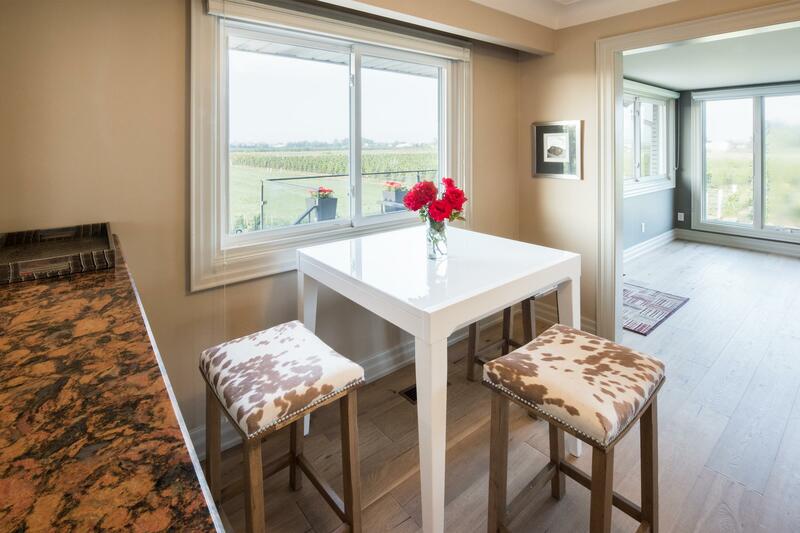 Close location to wineries and a 20 minute bike ride to the town of Niagara on the lake. Mark was available if we needed anything throughout our whole stay. We will definitely return when we come back to Niagara on the lake! My family's stay was very enjoyable. We especially appreciated the new pergola. The design allowed us to enjoy the shad through out the day and even into the evening. Just great! We had a lovely time at the house, a beautiful location in the midst of vineyards. The house was beautifully furnished, the most comfortable beds ever! And the kitchen so well equipped, we wished we had had more time to be able to make more use of it. Mark was very helpful and made us very welcome. Mark is an amazing host and the property is an amazing place! The property is well maintained and the location is very peaceful and quite. Great location for a family get away or a just a weekend away from the city. We rented On Seven Residence for a girls weekend. We spent the evenings cooking in the awesome kitchen and sitting around the huge dining room table laughing and drinking wine. 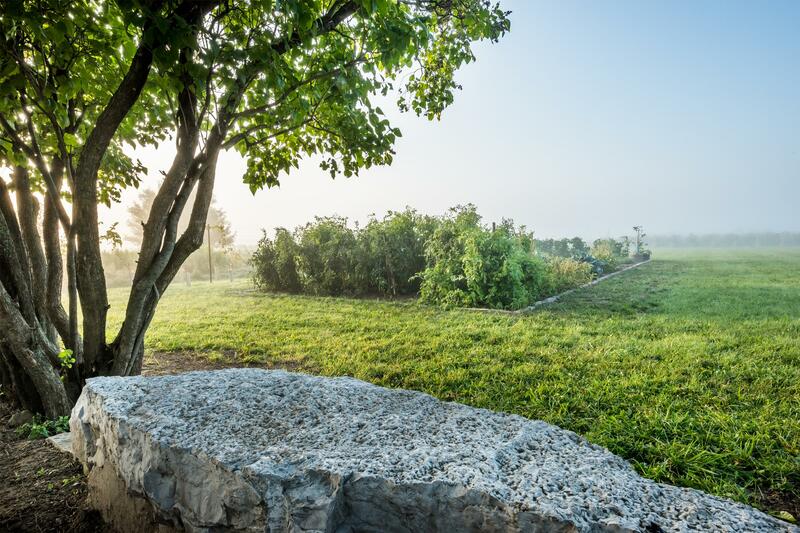 The landscape surrounding the house is beautiful. The beds were very comfortable and the linens were gorgeous. Appreciated all aspects, even down to the wine decanter. The location to the wineries was great, too! Would definitely recommend to others! We had a group of 4, two couples, and enjoyed staying at this house. The surrounding property is beautiful - vineyards all around - and very peaceful. The house if spotless. Kitchen was great for cooking! We were close enough to the wineries and town to make travel easy, but far enough away so it felt like we were truly on vacation. In May 2016, myself and 5 girlfriends stayed at Mark's OnSeven residence and had a wonderful time. Mark was very accommodating with our late arrival. Everything in the house was easy to locate and everything that we needed was provided. The backyard is beautiful and pictures do not do justice. Location is perfect, as it is a short drive to oldtown and the outlet mall. Thanks Mark! We hope to return soon. This was very lovely and cozy stay despite being hit by the coldest winter day in 22 years. The house was spotlessly clean with modern decoration. It was perfect size for our family of 6. We would definitely stay here again in a nice summer day so that we can enjoy the bbq and backyard. Mark made us feel very welcome. When we arrived everything was sparkling clean and he was there to greet us an explain the functioning of everything. Honestly the pictures on airbnb do not do the place justice. The views are spectacular. The vineyards look amazing throughout the day, but specially at sunset. Everything was to our liking. As a family of five it can sometimes be difficult to please everyone but we were all very happy here. The house is very modern and well equipped (the kitchen even has a turkey pot in case anyone spends Thanksgiving here!). Rooms are good size, bed is soft and pillows are fluffy. The bathrooms are very nice, with Ralph Lauren home towels (very soft). There are free coupons for free wine tasting in many of the local wineries. You won't regret staying here! 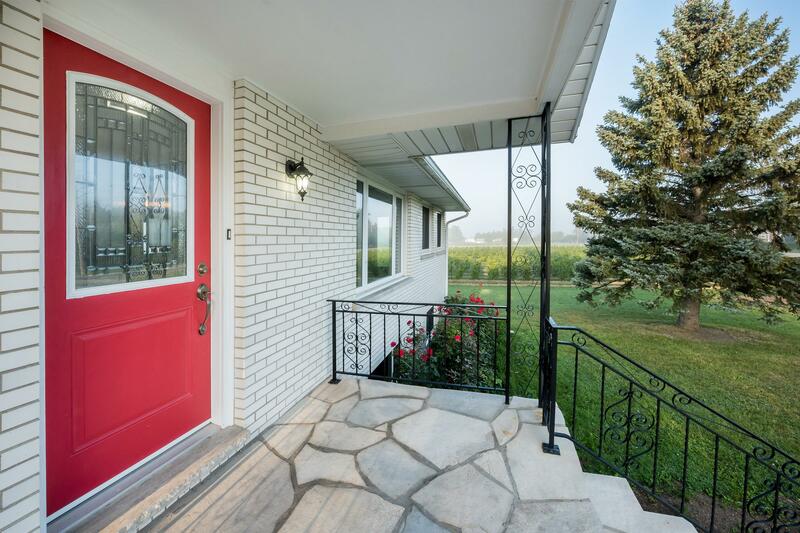 The listing was as beautiful as the pictures and located in a very serene environment. We spent a lovely weekend in Niagara on the Lake, making "On Seven Residence" our cozy home away from home! It's close to everything, but also offers you privacy. The house itself has a beautifully decorated main level, with a minimalist feel to it, and the backyard is spacious with lots of seating options. We enjoyed several games of frisbee on the lawn! The photos and description of the property are accurate. Came out here for family vacation with 6 people. Lovely space that lives up to their beautiful pictures. Barely wanted to leave the house so we can just hang and enjoy the relaxing atmosphere. 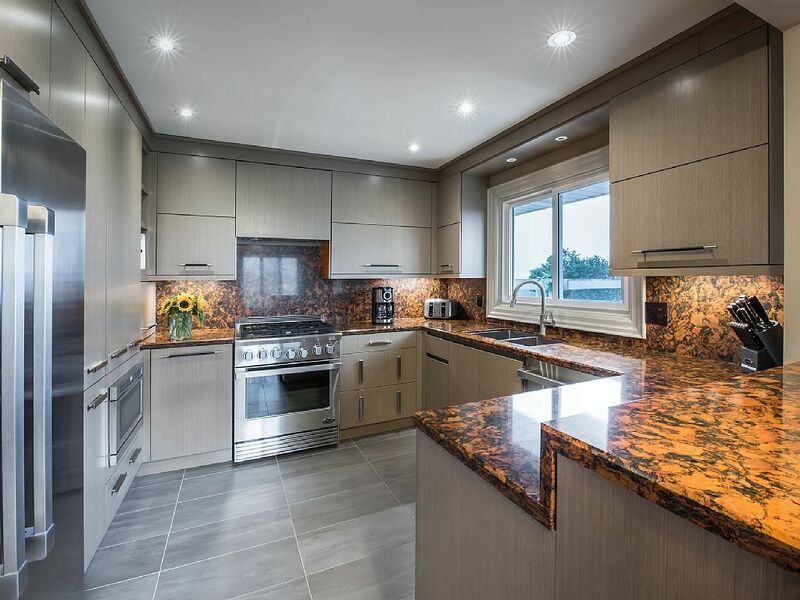 Clean & professional, this is a great place that's close to both Niagara-on-the-lake and Niagara Falls. I stayed at Bruce's wonderful house with 6 friends on a weekend where we went on a wine tasting tour. We had a great time and the house was a big part of that. It's very cozy, well decorated and has everything you could possibly need. The beds were very comfortable and Bruce left more then enough towels for everyone. Also, the location is great. Just a few steps from the river and lake and nit even five minutes to the main street with lots of restaurants and shops. We would have loved to stay longer and enjoy this beautiful place. Thank you, Bruce! We stayed just one night at this beautiful property, and were extremely impressed by the house and our host. Very welcoming and accommodating, and we felt quite at home during our stay. Highly recommended!